Just when we thought that the gift industry is content with the traditional categories of personalized gifts, a new trend – called ‘push presents’ comes along and gives birth (pun intended) to a trendier and more fashionable world of ‘tokens of appreciation’. A push present, also popularly known as ‘baby mama gift’ or ‘baby bauble’, is a gift given by the father of a new born to the mommy as an acknowledgement for all the hard work and the labor pains she has had to go through in bringing their bundle of joy safely into this world. Thanks to the celebrities and glamorous Moms like Victoria Beckham and Mariah Carey, whose equally glamorous husbands pampered them with expensive jewelry to mark the momentous occasion; since then the popularity of push presents has really taken off. A recent survey of more than 30,000 respondents by BabyCenter.com shows that 38 percent of new mothers received a gift from their partner after giving birth to their new born. Among pregnant mothers, 55 percent wanted one. About 40 percent of both groups said the baby was the only gift that they desired. The rising popularity of push presents has to some extent evoked criticism from mothers who consider their babies to be the greatest gift imaginable and think that any kind of tangible bonus cheapens the purity involved in giving birth. While a large percentage of new mommies think it’s perfectly okay to not feel guilty about accepting push presents, especially after all the back pain, morning sickness, and stress that they have gone through. Research shows that jewelry is the most desired push present among new mommies. The jewelry industry certainly capitalized on this growing trend by marketing their diamonds to the expectant parents. In 2005 the jewelry chain – Mayors promoted their diamond earrings with the tag line, “She delivered your first born; now give her twins.” Fortunoff, the jewelry and gift chain with a Fifth Avenue flagship, recently established a push present registry. Although jewelry is the most common push present, any new baby gift that would make the new mommy feel special and pampered will suffice. Is your bundle of joy on its way? 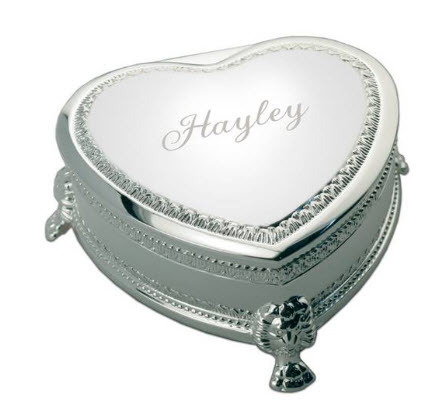 Would a push present or a heartfelt engraved gift from your hubby put you on cloud nine? If yes, then would you prefer a sparkly gift or a personalized gift? Or do you think your baby is the greatest gift that you could ever receive? All the mommies-to-be, we are eager to know your thoughts. Please post your responses below. And what are our two cents on push presents? Be it any occasion or season, we believe that giving gifts that express love, gratitude, and appreciation should never go out of style. Having said that, push presents are certainly trend-setters in their own right. To all the fathers-to-be, here’s your chance to make the sleep-deprived, first-time mommy feel absolutely glamorous by selecting the perfect push gift for her, a memento of the special day when your adorable bundle of joy stepped into this world. I got a push present from my husband, even though I had no idea what that was prior to giving birth. He gave me the Signature Pendant from Juno Lucina which is SO beautiful. I love it because it reminds me every day of our baby boy and I get so many compliments on it. Way to go hubby! !